Economic empowerment through rubber cultivation for sustainable rural community development to alleviate poverty. To deliver quality extension services to rubber outgrowers through advance and innovative technology by our motivated staff. To enable outgrowers have sustainable income, enjoy a better living and to contribute to national development. To collaborate with all stakeholders to effectively and efficiently utilize public funds to improve the living standards of the rural communities. It was launched on 1st January 1995. Four hundred (400) Outgrowers were assisted to plant 1200.28 hectares over a 5 year period instead of six years. To date 3500 hectares of old plantations of individuals and co-operatives have been rehabilitated as against the target of 1300 hectares. Purchases from Outgrowers averages 2000 tons drc per annum. Forty-one (41) kilometers of roads were rehabilitated. Financed by Agence Francaise de Developpement (AFD), IDA/World Bank and Government of Ghana an amount of 1.643 million euros. It was launched on 14th September 2001. Five hundred (500) Outgrowers were assisted to plant 2854.65 instead of 2800 hectares over 5 years. Rehabilitation of 20 km of road achieved. The Rubber Outgrowers and Agents Association (ROAA) was organized to become a major stakeholder in the rubber industry through a contract agreement with Institution and Development, a Non-Governmental Organisation. Research on outgrower fields entrusted to CIRAD. Eighty-three (83) trials, involving 73 outgrowers and 10 at the Factory were put in place. It was financed by AFD and Government of Ghana was to the tune of 6.93 million euros. Planting of 7000 ha for 1750 outgrowers in Western and Central Regions. Provision of credit facility to enable farmers develop their plantations. Applied research on Outgrower fields for increased productivity. Strengthening the Rubber Outgrower and Agent Association (ROAA). Spot improvement of 70 km of roads. Cummulatively 1800 Outgrowers have been assisted to plant 7885 ha. 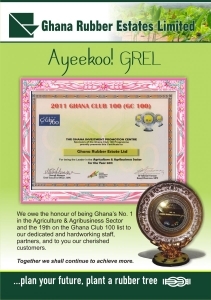 The Financial Operator is the National Investment Bank Ltd. whilst the Technical Operator is Ghana Rubber Estates Limited (GREL). It would involve 2800 outgrowers to plant 10,700 ha. between 2010 and 2015. To date 2850 outgrowers have been assisted to plant 10,700 ha. Planting to date ( Phase I, II, III and IV) 5500 Outgrowers have been assisted to plant 23340 ha. 1330 Outgrowers farms involving 6000 ha are under tapping. Tree planting thus contributing to afforestation in the project area and enhancing the environment as well as regularizing the rainfall pattern. Employment opportunities in the project area thereby checking rural/urban drift. Supply of raw materials to the local factories dealing with rubber products. Boosting rubber export thus earning foreign currency for the country. Participation of women in the project thereby enhancing women emancipation. Developments of access roads in the operating communities to assist other farmers transport their goods to marketing centers. Supply of rubber wood to the Timber industry thereby saving our scarce forest reserve. Total natural rubber consumption in 2004 was 8.4 million tons and demand for it is projected to be 11.9 million tons by 2020, and 14.4 million tons by 2035. Since the demand for tyres and tyre products is increasingly being dependent on natural rubber, coupled with the increase in the shift to radial tyres, increased production of commercial vehicles, the consumption of natural rubber would increase on the average by 2.5% per annum. However, the production capacity of natural rubber is declining due to the age and quality of trees because most of the plantations were planted in the 1950’s, and the rate of replanting is also slow. This situation coupled with the creation of a price regulatory body called International Rubber Company (IRCO) will ensure the stability of prices. This trend indicates that the future of rubber is bright.